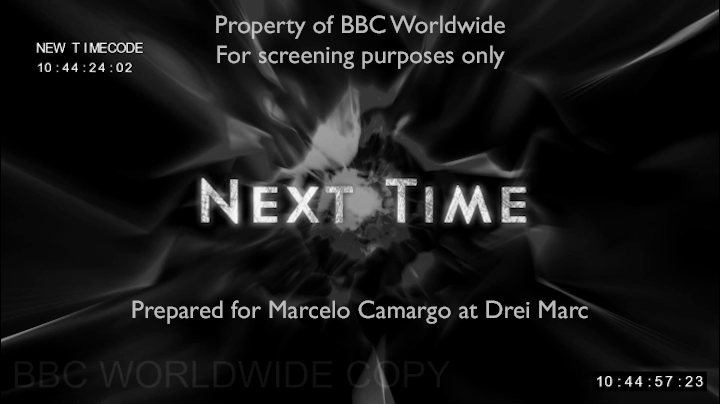 Several weeks after the initial script, workprint leaking and a few days after the second load of workprints become available, the 5th episode, Time Heist is now available online. The much anticipated episode 4, Listen, appears to have been skipped. Episode 5 was added just a couple of hours ago but, unlike all previous episodes, it was fully uploaded in just an hour. Like the previous workprints, this one is also in black and white, with missing ADR and unfinished CGI, although it isn't cropped for an unknown reason. It can be presumed that the other episodes will follow in due course, although it is unknown why Listen was skipped, though I presume it is because it has little CGI so would be most like the finalised edition. This is getting truly ridiculous now. Either the BBC has the worst anti-piracy/anti-theft measures ever devised, or these "leaks" are intentional. I could see the leak of one or maybe two episodes happening before measures are taken to prevent any more. But this is the FOURTH episode that has been leaked, and I wouldn't be at all shocked if more are on the way. It's happened too many times to be just a horrific string of unfortunate happenstances. There was only one leak - ALL this material was nabbed at the same time. The person who got hold of it has just decided to release it bit by bit. Fans have turned the leaks around from a negative to a positive story. The view about all of the leaked episodes is resoundingly positive with most declaring this run as the best ever in Who history. Now that Deep Breath has been screened for critics and some lucky people as part of the global tour, it has been confirmed as definitely a 5 star episode,just as those who saw the script and rough cut knew. The other leaked cuts of episodes 2,3 and 5 all confirm that the stong scripts have translated into great episodes. While Moffat's episode four hasn't been leaked as a rough cut, I can only echo those who have read the script who have already labelled this an instant Hugo and probably BAFTA award winner. I would go so far to say this is better than Blink or The Empty Child. Now we now that Capaldi is indeed a superb Doctor, I cannot wait to see him in this one. Seeing how confident, excited and happy Moffat, Capaldi and Jenna have been during the tour, you just know that they know that this is a completely new take for Doctor Who which has restored it to the glories of Season 5 (and personally I think on therxisting evidence it is even better than that). So w hile the leaks are disappointing, for the greedy fans like me, it has allowed us to actually reassure eveyone before the season starts that Peter Capaldi is fantastic and Moffat has honored his promise to fundamentally change and strengthen Who andthatwell, this is the bestthat Who has ever been since its return in 2005. Good times. Episode 4 is absolutely appalling(the worst new Who episode by a mile and possibly the worst Doctor Who episode ever).Episode 5 isn't that good either.Episode 2 and 3 are great though.I can't talk about why I hated 4 so that I don't release any spoilers from the leaks.